Would this not make a lovely painting? My butterfly bush was an especially beautiful treat today! Very few blooms at the moment but the butterflies stayed on it all day. The sedum was found with sweet nectar as well! Everything blooming was covered with a honeybee preparing for winter! Cooler weather is good and upon us and we’ve actually had a fire in the woodstove several nights to take out the chill and dampness. Fall has crept in on us with the trees changing color and the shadows falling on the ground remind me of Halloween. Pumpkins everywhere we go and bales of straw. Scarecrows sitting in every nook and cranny! With fall come the acts of nature that we overlook until you almost walk into it! By this I mean, bee nests and I walked right under this one several times before actually seeing it! I walk along this path several times a week as do the heifers when going to water. Can you see anything hanging from the tree? My first encounter was in July and I walked through that path about six times one looking for little chicks in distress because they couldn’t find their mom. I never saw a thing while walking but that afternoon I was in the laundry room folding clothes and looked out the window and there hung a hornet’s nest the size of a volleyball! It’s now about 18 to 20 inches long and about 15 inches thick!!! We didn’t want to destroy them because as long as you leave them alone hornets are good! They catch thousands of houseflies!! That’s the GOOD! The BAD is if I had walked into their nest and made them mad!! I would have been stung several times before realizing what was happening! The UGLY is those insects are black, big and build onto that nest all summer. It’s huge now! During the day the hornets are flying in and out of it and there are guard hornets marching all over it to protect the hive. When I walked under it in July it was about seven feet off the ground. Now it’s so heavy and hangs about three feet off the ground. I’ve found a new path around it so I don’t disturb them! Along with the hornets we’re seeing lots of bumblebee’s which have a nest in the ground in my rose garden. The rose garden is a mess now because I can’t get in it to weed. The yellow jackets and sand hornets are all over the apples in the orchards but we haven’t found their nests yet. All of the bees make great pollinators but they do have an ugly and mean side!!! 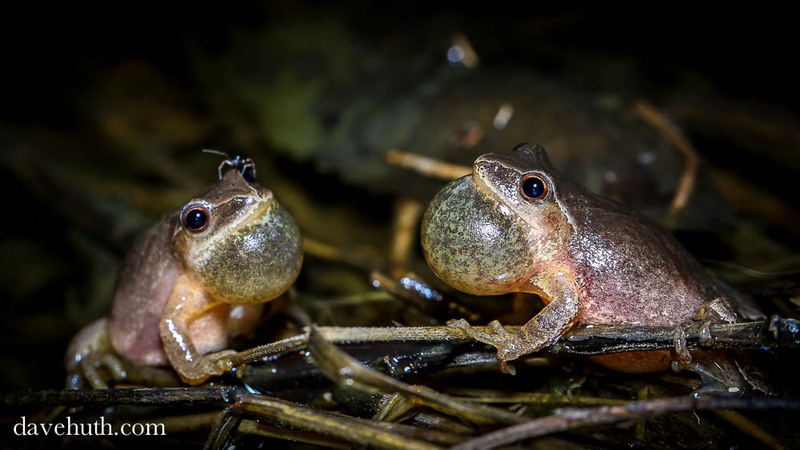 Have you ever heard of petoots or spring peepers? It’s those noisy little beings we hear every spring when it starts to get warm! I love hearing them but I’ve never seen them or ventured out to see what they looked like. I’ve always assumed they were little tiny frogs. This year I found out!!! I went with hubby one morning to feed the cattle and in our back field we have a small pond that’s never gone dry (yet)! As we drove by the pond we could see the pond just wiggling with life and the noise was deafening. We went to the back-end of the field and dropped off the hay to roll off the hills to the cattle and then drove back to the pond. I had my camera with me and finally got pictures of hundreds of the little noise-makers and they weren’t a bit afraid as I took their picture! You can click on the photos to enlarge and see what I’m talking about. Usually where there’s one, there’s two! The noise was deafening and hubby says when he spring turkey hunts you can’t hear the turkey for the frogs! This isn’t a very big pond but the entire pond was covered with the little buggers! So, my friends, spring petoots, means mating season for frogs!!! Now all I have to do is find out why we don’t hear the whippoorwill anymore!! I love listening to them as much as the petoots and grouse drumming in the spring! We watched him and took the pictures from our front porch. These were taken over a month ago but we saw it and a younger one that hadn’t matured with the white feathering last week. We also had a golden eagle here most of the winter. Fall is here and so are the fall wildflowers. Here’s a few I took photos of just along the driveway from the house to the mailbox. Wild touch-me-nots, blue mini daisies and more. I love these but don’t know what they’re called and they remind me of liatris, I think?? They’re not bluebells but the bloom is somewhat shaped like them. Shaped much like black-eyed susan but different. Goldenrod, gorgeous but sure does mess with my nose. These aren’t as blue as they normally are and our neighbor has a field full of them. When the sun hits the field in mid-afternoon the entire field looks blue. Chicory is popping up everywhere. These little orange jewels bloom and then have a pod that when touched pops open. The driveway is full of the huge plants this summer/fall. Tons and tons of bloom and full of teeny tiny bumblebees. Queen Anne’s lace is huge this year and maybe due to all the rain we received spring and summer. Goldenrod at it’s most beautiful. I don’t know what this is but most of it is white with yellow centers like a daisy but much smaller and abundance of bloom. I’ve also found the same plant but blue with orange centers. Once the weather cools a little and I can get out in the sun there will be an abundance of wildflower and nature photo ops. Winter 2014 warmth stockpile to be completed. On Sunday morning we took off to the woods and started cutting for the 2014-15 heating season. We found two oak trees that had been dead from the gypsy moth invasion three years ago and put more than a ton of weight on the farm truck. Here’s a view of the visit with nature. We were there for about one and half hours and Hubby sawed the trees up and loaded the heavy pieces which were way to heavy for me and then I loaded the lighter stuff and enjoyed being in the woods. I enjoy anything that involves us being outdoors together and I love the smell of fresh cut firewood. One of the trees was blown to the ground and heavier than the other because it soaked up the last rain. The other tree was still standing but the bark had fallen off. This will keep us nice and toasty next winter. All we have to do now is split the big stuff and put it in the woodhouse. Hubby is checking the supers for production and they’re just not quite capped over but he pulled the ones that were full and replaced them with fresh frames. Smoking the hive a little to calm the bees so he can check this hive. It’s never been real productive but swarmed a lot. This year he added a brood box and an extra super and they working their little hearts out. They swarmed one this year about three weeks ago and instead of leaving the farm they went into one of the hives that died last winter. I guess when they were robbing the old honey out of it they figured it’s a nice new place to bring a new queen. He loads the supplies on the ATV and moves closer to the hives to work. It works well and has room to work without bringing the bees back to the garage. This is the smoker he uses. It’s old but still does the job. I save all the worn out jeans and he tears them into strips, uses his lighter to set it on fire and stuffs it in the smoker and pumps the bellows to get it going good. This fine, soft bristled brush is used to gently sweep the bees off the frames after removing from the hive. Sometimes the bees are persistent about hanging on but soon leave for the hive. Now you’ll see how he prepares the frames for replacing in the supers. The bees could make their own starter comb but this way it’s set in straight and they work from that foundation to make the smooth honey he cuts from the frame. He took honey out of the supers a couple weeks ago and then took some more this week. Most of the flowering they use this time of year makes darker honey. We like the lighter, sweeter honey so he takes off what we want to use and sale now before they add the dark nectar to the frames. We have mostly quarts right now of honey with comb and a few pints of strained honey. I’m still cleaning up wax all over the kitchen. We sell the quart with comb for $9.00 and the quart strained for $14.00. The pints with comb are $7.00 and the pint strained is $9.50. We lost five hives last winter and honey is in short supply and we had to raise the price this year to restock the frames and comb. The supplies are so expensive but the end result is awesome!! 11 quarts of honey w/comb, seven quarts strained honey and four pints of stained honey. He’s on the alert to danger! This summer we have been overrun with groundhogs. Normally, these varmints are out in the hayfields or the woods but this summer we’ve got then building their houses under every building on the farm and that’s a lot og groundhogs. Hubby believes that there’s really not that many more than usual. He thinks we just see them easier because they have moved out ot the fields and woods due to coyote pressure. We even had on build a home under and between the apple house and the cellar which has a small garage attached to it. This year I laid my onions on a board in the dirt floor of the garage to dry some before hanging them. The first batch did well and we got them hung but the second batch which was mostly white onions were eaten by the creature and hubby found out before they eat the whole batch. This is the two pieces of thin plywood that I dry the onions on in the garage. This is the hole he dug out in the garage for his home. Youngster living under the barn. Then there were two babies under the barn. We finally saw four kits from that litter. Time to nap in the sun! They’re destructive little creatures and will eat up a garden in a heartbeat! Smaller butterfly, brown, white and yellow. There’s lots of new beauty on my photo page. Click the button on my homepage and see some new nature shots. I’m so pleased with my flowers this year. I wanted to share some photos my daughter took last week while helping her Dad harvest some more hay! I think they’re beautiful! Jippy decided to take a nap!! It was such a beautiful day to be on the farm! We started out with six hummingbirds in mid-April and then it got cold and up until two weeks ago we only had one. I kept the fresh nectar out for him and finally we have five which I hope will multiply soon. Normally I have five to seven feeders on the front porch by now but they’re only using the two and I’m refilling the feeders about twice a week. I love these little guys and could watch them for hours. I make sure they have plenty of their favorite flowers in the yard as well. They’ve been very busy this weekend and I’ve heard their courting rituals several times today. The dipping dance they do is quite something. They’re quite territorial at the moment and they whizzed right in front of my face and caused Sassy to change positions on the porch for fear of getting “hummed”!! Everything was either coming out with bloom or full of bloom and we had two nights of frost around the 15th of May. The English walnut and pecan were burnt bad. Some of the apples, peach, cherries and pears were blooming really full and got the frost but we may still have a little fruit. Last night we had frost but not heavy and it didn’t hurt the tomatoes but hubby expects it again tonight. On my way into work this morning was much cooler than the last few days but the beauty I saw was so peaceful. Try to imagine this without pictures. Fields of orchard grass waving in the wind and looking like waves of green water. A sky so blue that you think you’ve never seen that blue before. Small, scattered, wispy, white clouds trying so hard to invade the blue sky. Full grown brown rabbits sitting along the road enjoying the warmth of the sun. A huge United States of America flag gently waving in the wind. Gorgeous orange poppies in flower beds bending gracefully try to touch one another. A long legged doe gently grooming her fawn while trying to hide in the tall orchard grass. Green leaves fluttering like butterflies in the tops of the trees. Quiet country road with no traffic but me until I come to the main roads. Country life is so precious, peaceful and quiet!! Like several farmers we’ve spoken to, our honeybees didn’t fair well this winter. We had eight hives and lost all but two. Bee house and time to check the hives spring 2013. One of the two hives is very active and the maple tree pollen is heavy this year. The other hive has never been real strong and swarms itself to death every spring. We are going to try a couple of changes this year, one of which, is bringing in a new queen. The first hive is weak but alive and the third hive is strong and working hard. Time will tell but we have to work fast since the orchards are full of apple buds and will blossom full in the next week to 10 days. The bees are cleaning house much like I do in the spring. This is one the hives that didn’t make it during the winter. Hubby has cleaned up all the hives that didn’t make it and have them ready to try to catch some swarms a little later. The hives that made it will now have two chambers for raising brood and when the right bloom pops out in the forest fresh supers will be placed on each hive for honey making. We have so many honey customers that depend on us each year to provide the liquid gold that is a big commodity these days. I’ve been asked to place it in our local artisan center but it doesn’t last long enough to get it there. Now, we sit back and wait and pray that we will be blessed with lots of the sweet nectar. Beautiful quart jars of honey and honeycomb straight from the hives.